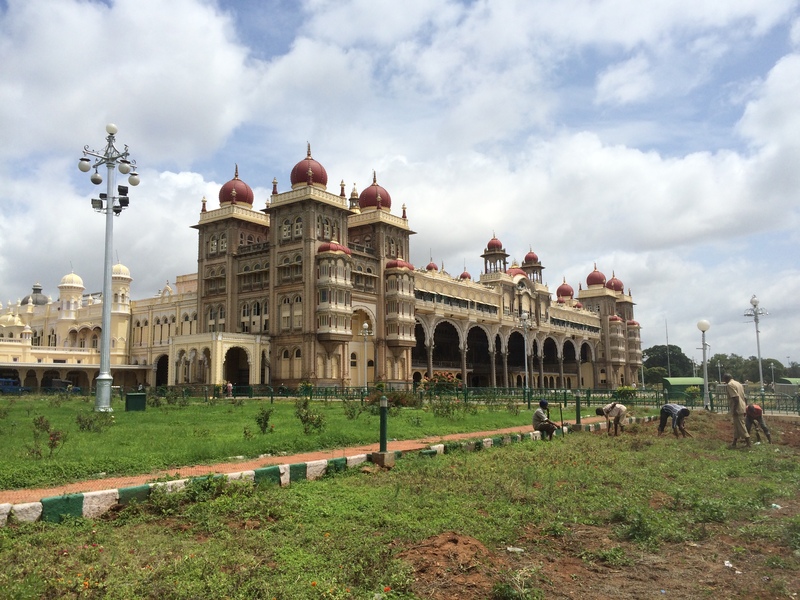 Mysore was everything that I had imagined South India to be. The journey from Kerala to Mysore was long. From Varkala, I took a rickshaw to the train station, took the hour train ride to Trivandrum, took another rickshaw to the airport, flew to Bangalore, then took a 4-hour bus ride to Mysore. The whole journey took about 13 1/2 hours hotel to hotel. The flight surprised me the most, since it was the first time I had come in contact with rich Indians. Most of these people spoke good English, wore t-shirts and jeans (even the women) and had smartphones. The flight was $60, which was more than most Indians can afford. While the Trivandrum airport was very dumpy (much like Chennai’s), the Bangalore airport was sleek and modern. It was all metallic and looked like one of those awesome East Asian airports like Bangkok. My bus ride from the airport to Mysore was also about 10x the normal cost of a bus ride (the airport bus companies must know their clientele). 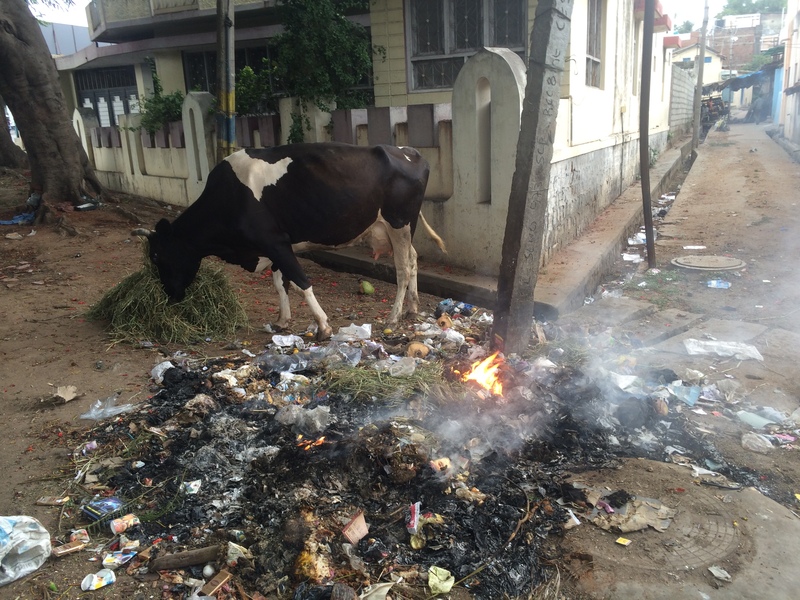 Typical Mysore street. The Raj architecture is phenomenal here. Arriving at Mysore at 1am was certainly not ideal. On the 500 meter walk to the hotel (this one I booked ahead), I was approached by dozens of very nice but fairly aggressive rickshaw drivers and drug dealers. Because Mysore was a popular tourist destination, these salespeople used a variety of tactics such as trying to strike up conversations with me before going in for the sale. Ignoring them really didn’t work I found, but asking them conversations about their life did. Once they realized I was not a potential customer, they lost interest and walked away. When I got to the hotel, the management was sleeping on the floor in the lobby. I felt bad waking them up, but I too needed a place to stay. The next day, I got a better lay of the land. In any city, my first order of business was always to walk around the neighborhood near the hotel. This way I could pick up landmarks and figure out what’s nearby. This was how I found breakfast- I stumbled upon a cheap fairly busy restaurant (or hotel as they call them here- there’s a story behind this) and got my masala dosa (savory crepe with Indian chutneys). My first real stop was the city market. 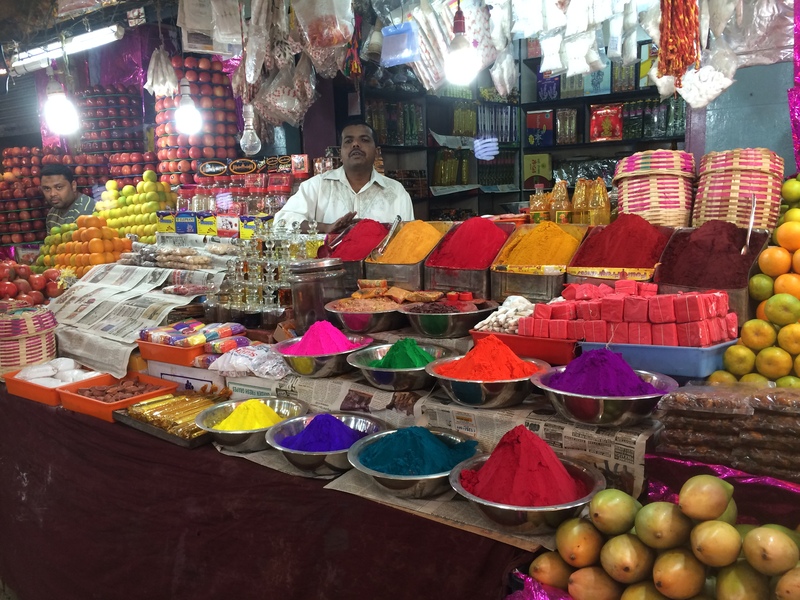 This was incredibly lively with people selling body paint powders, foods, spices, oils, and flowers. The colors and the people watching were incredible. I also met the most deceptive yet friendly salespeople here. They used really interesting tactics. One guy asked me to take a picture of him then asked me to email him the picture. Turns out his email was written on his business card which was conveniently located at his stall selling. One guy started giving me a tour of the market without asking for it. He simply just started talking wherever I walked. He then tried to walk me down the lane where his shop was located. I then walked away. Another person invited me for tea, then told me that there was a small festival going on in the Muslim market and that he would take me there out of “good karma”. When I refused, he kept asking me. After ten refusals, he still didn’t understand that it wasn’t going to happen and that he started acting weird. I then said goodbye and left. The most common question I have been asked by salespeople/con-men is “where are you from?”. When I say USA, they immediately tell me how they have a friend in the US who is most likely an American who shopped there 10 years ago. Saying USA in this situation meant that you had a lot of money and could not bargain. When I don’t feel like talking to the salespeople, I will say that I am from Israel. Since Israelis are no nonsense people and among the best bargainers in the world, the salespeople would usually leave immediately. People often asked where I was going and I always said the Palace, the main attraction in town. Most of the people I met said the palace was closed today or that in the afternoon, there is a discount for foreigners. These people also suggested I hang out with them in the afternoon. After about an hour in the market, I decided to take my chances and walk over to the palace. 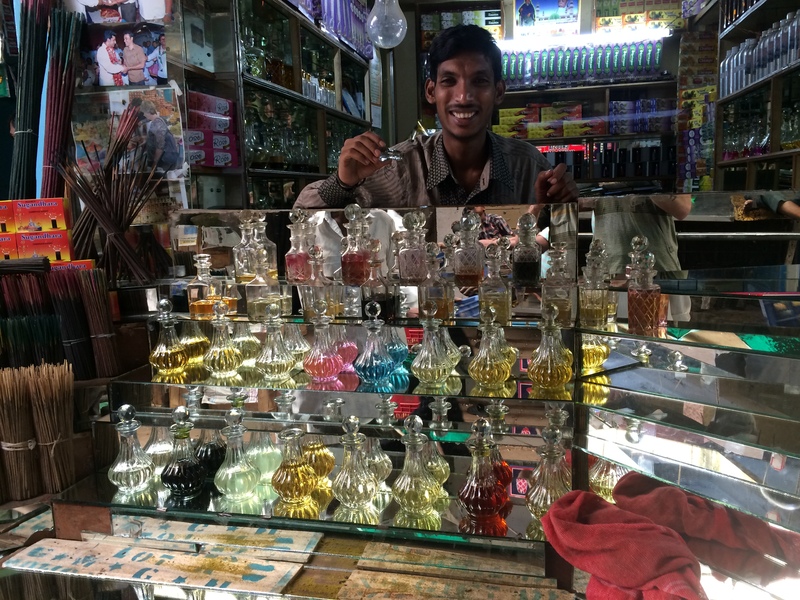 Oil salesman- this guy was actually really nice and the best person I met in Mysore. Like expected, the palace was indeed open (it actually stayed open all year except for a festival in October). A former Maharaja’s palace, it was one of the most beautiful buildings I have ever seen. While the entry price was steep ($3.50 for foreigners), it was well worth it. The inside (no photography allowed) was unbelievably ornate with more gold than Fort Knox. My favorite room was the blue and gold private durbar hall where the king would hold private audiences. The building was occupied actually all the way up until the 1970s by the maharaja and his family. I believe the maharaja still lives in Mysore and functioned as a ceremonial leader of the town. The audio guide included a welcome by the maharaja. After touring the building, I walked around the grounds. In the back of the palace, they were offering elephant rides for just 100 rupees ($1.60). Since I had never ridden on an elephant before, I decided to give it a whirl. I found someone standing near the elephants and paid him 30 rupees to follow the elephant and takes pictures of me using my camera. 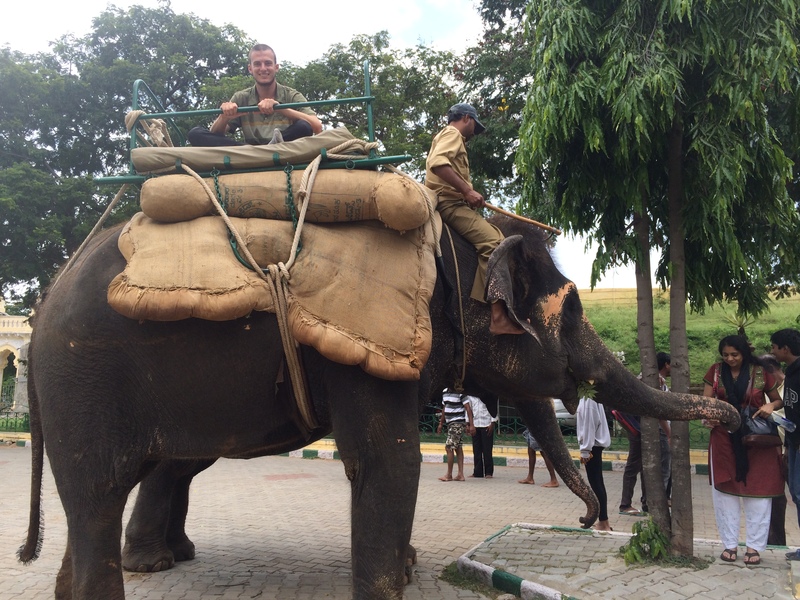 I then got on the elephant where the driver walked me around the palace grounds. He tried to get the elephant to pose (using questionable methods) and even let me sit on its head. At this point, I was very pleased with the whole experience. He then led me behind a corner where nobody was watching except my cameraman. The elephant driver then insisted I give him a tip for the ride. I told him that I would once I get off the elephant but he said I had to give him a tip now. We argued for about 15 minutes and then said that I won’t give him a tip unless he takes me back. He still refused and kept insisting on a tip while we sat on top of the elephant. I then pulled out a 50 rupee bill but he said I had to give him 1000 (about $16). I then refused and he kept lowering his price until he got to 60 rupees or $1. Pulling out another 10 rupees, I gave him the 60 and he walked me back to the loading area. While I was somewhat upset that I had been held for ransom on top of an elephant, it ended up not costing me too much and will be a funny story to tell the grandkids. Not happy because I’m being held for ransom on the elephant. Not much else interesting happened the rest of the day- I went to an internet cafe to write the blog post on Kerala and saw a mediocre sound and light show at the palace that was cancelled midway because of rain. I met a schoolteacher from Vancouver at the sound and light show and we got dinner together. He recently moved to China to teach English and really liked it. The next day, I went to visit my friend Kendall who was staying at a yoga ashram in town. She was planning on spending the next 10 days in the ashram. We met in Pondicherry and it was great to share travel stories from the past two weeks over coffee. While she didn’t see as many cities as me, she did a lot more yoga and made a lot more friends. That said, she certainly had her fair share of adventure in Rameshwaram, a temple city near Sri Lanka. Her way of traveling was much more personal since she generally stayed in one destination for awhile and really soaks up the local culture, while I was a much faster traveler. There is no best way to travel. 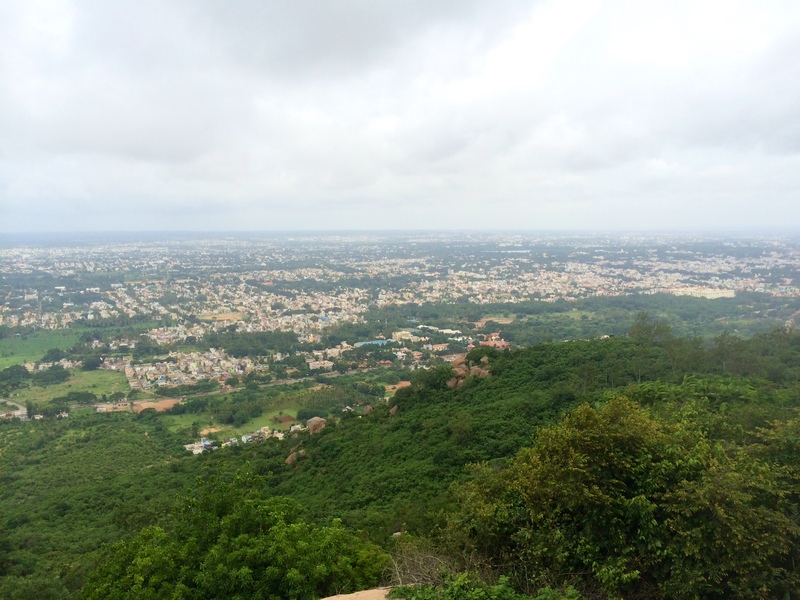 After breakfast, I climbed up Chamundi Hill. It was 1,000 steps to the top. Halfway up there was a cave temple and a giant Nandi (bull) statue and at the top there was a golden temple dedicated to Pavarti. The hike up took me just about 20 minutes (still got my Mt Everest legs). In line for the temple, someone said “take the offering”, so I grabbed a bunch of goodies from the man at the front door and walked in. I got blessed by the priest and got to keep a nut statue of Ganesh. After all of this, the man who gave me the offering made me pay 200 rupees for it, which was very expensive for a temple offering in India. For some reason, that really got to me and I was upset the whole way down. Maybe I was angry because right at the end of my time in Mysore, I finally got scammed after avoiding hundreds of touts. It’s funny how something so trivial upset me. At the end of the 45 minute bus ride, I was over it and ready to move on. 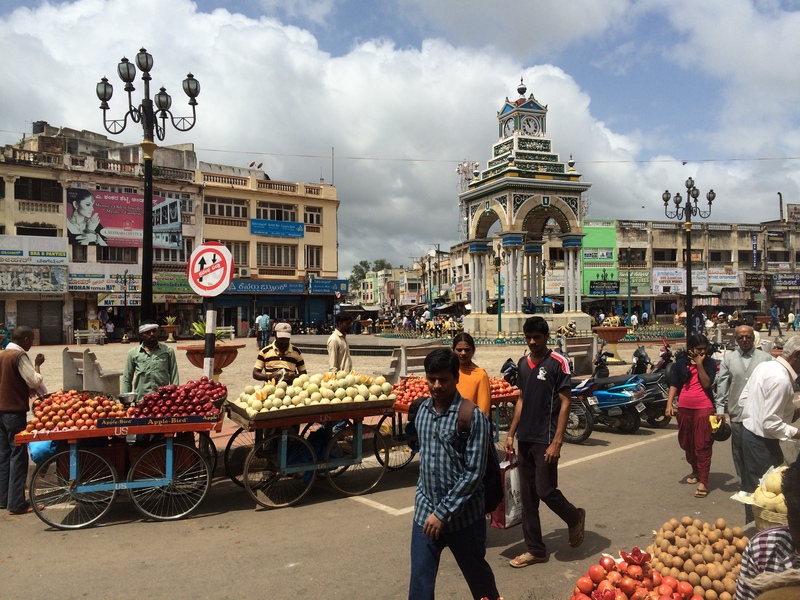 I would certainly recommend that every South Indian traveler visit Mysore. The architecture is fantastic, the food is good, and the sights are fantastic. Just watch out for the touts.